The use of models in decision support is important as field experiments provide empirical data on responses to only a small number of possible combinations of climate, soil, and management situations. Yet, crop modeling by African scientists so far has been limited. Therefore, to build the capacity of African scientists in the use of decision support systems, a provision was made for training within two main projects: Water Challenge Project (WCP) and Desert Margins Programme (DMP), jointly led by TSBF-CIAT (Tropical Soil Biology and Fertility Institute of the International Centre for Tropical Agriculture) and International Centre for Research in the Semiarid Tropics (ICRISAT). A unique approach to training on modeling was developed and was based on four main pillars: (a) learning by doing, (b) integrated follow-up, (c) continuous backstopping support and (d) multi-level training embedded in a series of three training workshops. Although crop models are useful they have limitations. For instance, they do not account for all of the factors in the field that may influence crop yield and inputs must be accurate for simulated outputs to match observations from the field. Thus it is imperative that these issues are carefully considered and weighted before attempting to evaluate the predictability of a crop model. 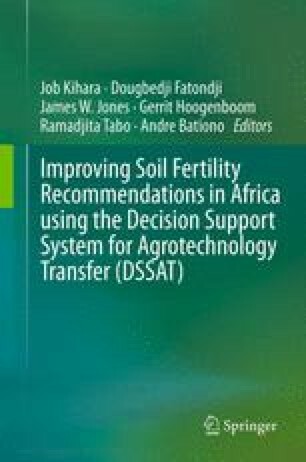 However, the use of crop models and decision support systems in concert with experiments can provide very useful alternative management options for resource-poor farmers in Africa and other regions across the globe.